The flag of Carmen de Apicalá can be seen at <carmendeapicala-tolima.gov.co> and wikipedia. The license information on that Wikimedia page, entered incorrectly, suggests that image comes from: < http://www.carmendeapicala-tolima.gov.co >, maybe < http://www.carmendeapicala-tolima.gov.co/nuestromunicipio.shtml?apc=m1i1--&m=f >, which has the same curious choice for the jpeg format. However, that's just a thumb, and the Wikimedia image is much bigger and has more detail. 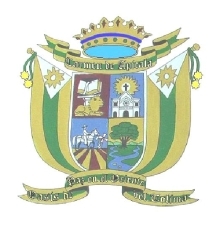 The image from < http://www.tolima.gov.co/municipios/carmenapicala/aspectos.html > suggests the yellow border isn't part of the flag, though. Note that owing to everyone involved being hobbyists, the name of the general sort-of organisation, "Wikimedia", differs only one letter from the name of the original project, "Wikipedia". Additionally, images in a wikipedia may be stored in that wikipedia itself, or may be from "Wikimedia Commons". With little overview to keep such confusion from happening, it's up to us to make sure we use the correct reference. In this case, this version of the image is from Wikimedia Commons. The image is indeed in use here. I would have liked to standardise the colours and remove the border, and I seriously doubt the stripes and the sun should be different shades of yellow, but there are so many artefacts from the jpeg that it's beyond my meagre skills. Is there a real giffer who happens to have some spare time? BTW, if we want to keep the Wikimedia image, then we'd better store it ourselves. Sooner or later someone is going to notice it doesn't have a "proper" license, and very soon after it will have been killed off by the license police.